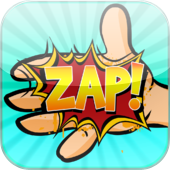 Home >> News >> Hand Zapper Prank – In Review! Our first app has officially entered the review phase in iTunes! Prank your family and friends with this modern take on an old classic! Charge up the buzzer by repeatedly turning the phone and have an unsuspecting victim touch anywhere on the screen. Also features an “incognito” mode that hides the buzzer but still emits the “zap” when touched.